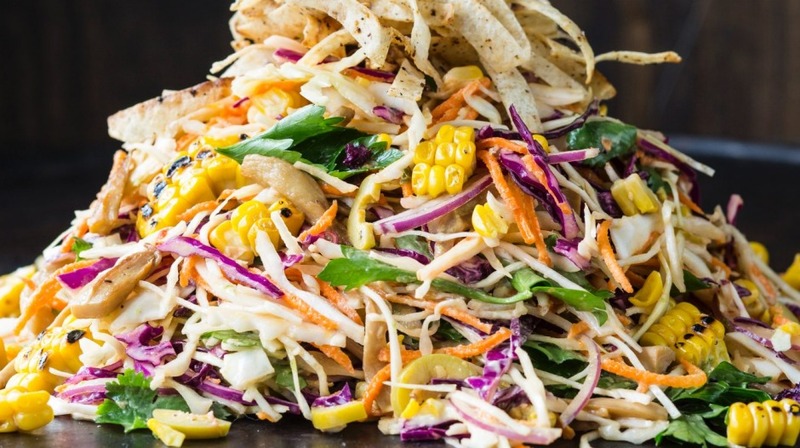 To build the salad, combine all of the ingredients in a large salad bowl and add enough of the dressing to lightly coat. Note: Chilli and lime salt can be found at any Latin supermarket, or you can simply use sea salt instead. Coat the cauliflower with the oil, season well with salt and pepper and spread out on a large baking tray, roast for 30 minutes until golden and cooked. Meanwhile, cook the pearl couscous in salted boiling water for about 5-7 minutes until tender, drain. Melt the butter in a large frypan over medium-high heat, once foaming and nut brown (1-2 minutes) add the sage and stir gently until crisp, remove the sage and set aside on paper towel. Reduce the heat to medium, add the garlic and coriander, cook for 30 seconds, then add the cauliflower, couscous, lemon juice and almonds. Stir to coat everything well, season with salt and pepper. Transfer to serving plate and top with sage leaves and crumbled feta. I don’t usually follow a recipe for the gnocchi as you will find that the amount of flour may vary according to the potatoes you use and how much butter you feel like adding! For a fluffy gnocchi, it’s important not to over mix and add only enough flour to keep it together without it being too sticky. Our daughter has gone vegetarian since the start of the year and her favourite combo with the gnocchi is ye old classic - burnt butter and sage and I add some roasted pumpkin in there with lashings of parmesan. Peel your potatoes and cut them into even dice (usually quarters). Place in a medium-sized pot, add the salt and cover with cold water. Boil until soft and push through a potato ricer onto a bench or in a bowl with the flour at the bottom. Before mixing together, add the butter to the hot potatoes to melt. Add the egg once the butter has fully melted and slowly bring together the mix. Roll out into cylinders and cut into even sizes. It doesn’t matter how big you want to make them, just ensure they are the same so they all cook evenly. Bring a large pot of salted water to a rapid boil. Cooking in two batches, slowly plop in each gnocchi trying not to overlap and once it’s come back to the boil, reduce to a simmer until the gnocchi floats to the top. 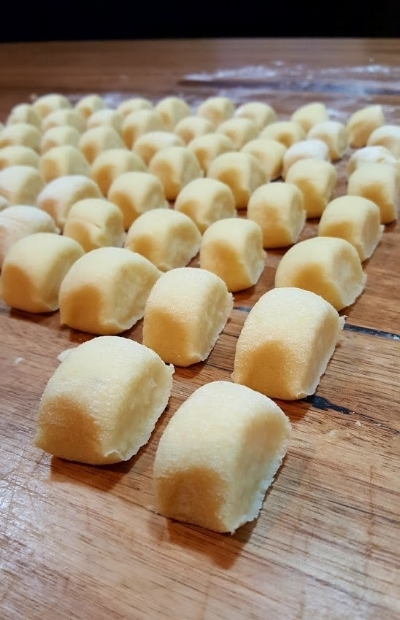 Remove and repeat with the remaining gnocchi. If not serving immediately, coat with EVOO to prevent sticking. It seems like an awful lot of salt. To take your gnocchi (and mash potato for that matter) to a whole new level, it’s always best to season in the pot at the beginning as it will flavour through the potato. There is no need to then add any salt later. You can also add freeze-dried vegetable powders such as beetroot. (mix into the flour) Just be aware that if you boil them to cook through, you will lose a lot of their colour. Best to steam! Slice the zucchini lengthways with a potato peeler, pressing hard to get a thicker slice. If you have a mandolin, use that for lovely clean slices. 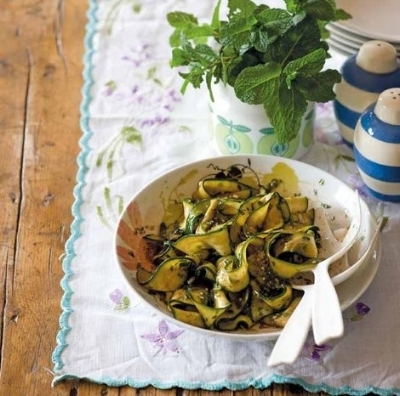 Put the zucchini in a bowl, sprinkle with salt and toss well. Leave for 1 hour for the salt to draw out the moisture. Drain the zucchini, squeezing to get rid of the liquid. Put in a serving bowl with the garlic, oil, vinegar and mint and mix well. Leave to stand at room temperature for about 30 minutes before serving. Mushrooms are naturally high in umami inducing glutamates but the addition of our Shio Koji (or Umami Salt) takes them to the next level. This is a great way to prepare mushrooms for breakfast or before adding them to any other dish that may call for mushrooms like a stroganoff or mushroom soup. Heat a small saucepan over high heat. Add the olive oil or knob of butter and cook the mushrooms until they just start to release their juices. Reduce the heat slightly. Return to a medium heat and cook with the lid off for another five minutes or until the mushrooms are coated in a delicious umami-rich gravy. These mushrooms are perfect served with scrambled eggs or in an omelette. MRS We love this as there’s very minimal prep involved but it tastes delicious. Below is a guide for vegetables and amounts but you can really use whatever veggies you already have at home that roasts well and ﬁll up your baking tray. I like to make sure there is a variety of colour and that the veggies are all cut into roughly the same size chunks so that they will cook evenly. Transfer the dish to the oven and bake for 40 minutes, then lay the haloumi strips over the veggies and bake for a further 15–20 minutes, or until the vegetables are cooked through and the haloumi is crisp and golden. Divide among plates and serve. Fry onion and curry leaves with three tablespoons of olive oil until slightly brown. Add okra, paprika, turmeric, the remaining three tablespoons olive oil and crushed chillies. 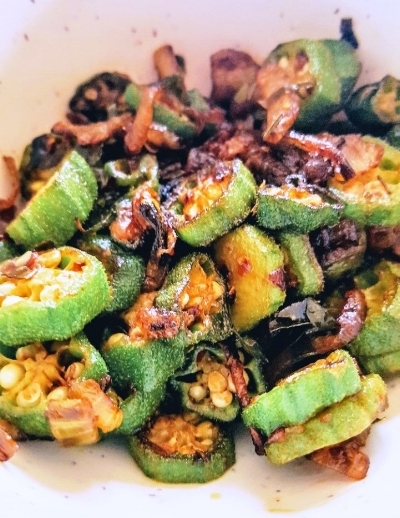 Cook for approx 10 -15 minutes on low heat until the okra is cooked. Add salt to taste. Perfect as a vegetarian main course and just as good as a side dish, my favourite version of Cauliflower Rice is colourful, bountiful and full of flavour. If you’re not familiar with this kind of ‘rice’ please let me explain! For a start, it’s not actually rice, it’s cauliflower turned into a rice-like rubble. Lots of people eat it because they’re avoiding grains or carbohydrates. I just eat it because I love cauliflower, not only for its own flavour and texture but also because it’s a great carrier of other flavours and textures, as seen in this bright and healthy vegan dish. Don’t turn away if you’re not a cauliflower fan. Heaps of cauli-phobes actually love cauliflower rice. Give it a go! 1. Place garlic and ginger into Thermomix bowl and chop for 2 sec/speed 6. 3. Add 1 tablespoon coconut oil. Cook for 10 min/Varoma/Reverse/speed 1. Check eggplant is soft (I hate undercooked eggplant). If still hard, cook for another 2 min/Varoma/Reverse/speed 1. When soft, turn vegetables into Thermoserver (or into a bowl covered with foil) to keep warm. You don’t need to wash the Thermomix bowl after removing the eggplant mixture but scrape it out well. 4. Place cauliflower and broccoli florets into mixing bowl. Add the kale and chop for 2 sec/speed 5. You are looking for an even rubble, around the size of rice grains. Chop for another 2 sec/speed 5 if necessary. Scrape down. 5. Add the remaining coconut oil and cook for 9 min/Varoma/Reverse/speed 1. 6. Toss cauliflower mixture with eggplant mixture. Gently stir through tamari. Check seasoning and add salt or more tamari to taste. Transfer into a serving dish. Scatter with cashews, spring onions, sea salt and grated lemon zest just before serving. It can be a good idea to stop partway through both cooking processes to scrape the mixture from the sides and base of the mixing bowl. Cauliflower Rice can be served warm or cold. Feel free to add fresh chilli with the ginger, or with the nuts at the end.